66.99 GBP Only 3 left In stock, ready to dispatch. 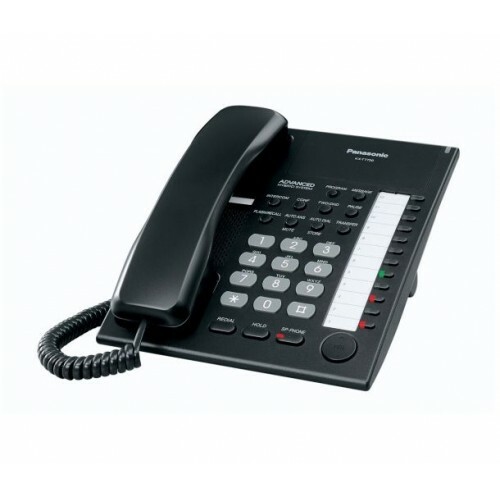 A straightforward corded phone, the Panasonic KX-T 7720 is ready for hands-free communication thanks to the provided headset port and a speakerphone, and it provides a useful range of other additional functions too. This stylish phone provides 12 programmable keys for one-touch dialling for your most frequently used contacts. Each key is also accompanied by a dual-colour LED for displaying alerts and status information, and there is an automated answer and mute feature too. Convenient and budget-friendly, the Panasonic KX-T 7720 is ideal for everyday use in the office. Works as expected, no complaints. Had to get an IT guy in to programme the system as we have six desk phones. Office system already had all the receivers except this last one. But Ligo are top of the list for supply of electronic goods - fast service and good stocks.